This is the final post in a series of five posts comparing and contrasting task-based and daily wear approaches to arc-rated (AR) clothing programs. Check out our first post here, and our posts exploring liability issues, challenges with layering, and challenges with monitoring and productivity. When choosing between a task-based and daily wear approach to protecting workers, the decision can generally be distilled down to the frequency your workers will be doing energized work. But is it really that simple? As we have seen in this series, task-based systems add significant risk and longer term costs in the form of liability, underlayers, heat stress, monitoring, and productivity, among others. As safety managers, the risks you face are real. Can you afford to gamble with lives on the line? To transcend basic compliance in favor of true protection, we must control for the unknown and minimize the risk of human error to the greatest extent possible. The simplest solution, with the least possibility for error and injury, is to specify AR clothing as daily wear, and require all employees working on or near energized electrical equipment to report to work in AR. This best-practice approach ensures productivity stays high, monitoring is straightforward, and liability is minimized. As Brandon points out, “there are so many different styles, so many different looks…the way they are making this [arc-rated] clothing now, there’s no reason why every person doing electrical work shouldn’t be in arc-rated shirt and pants.” Today’s AR clothing is lightweight, breathable, comfortable, and professional. Workers can even select a preferred combination of AR styles from a selection pre-approved by your company – with built-in tracking, spend enforcement, and other services. Want to explore a managed program for AR daily wear? Contact us at MarketingInfo@TyndaleUSA.com or reach out to our National Account Executive serving your area. 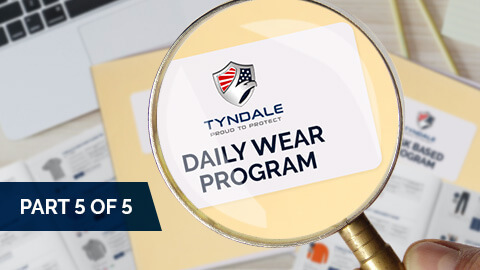 Click here to learn more about the daily wear options available today and the power of choice in keeping workers comfortable, safe, and compliant. Think you’re locked into a rental laundry program? Think again. Find out about the benefits management and workers can expect from a managed purchase program.